One of the things I did on my personal creative retreat was to tear out a fresh piece of notebook paper and make a list of everything bothering me. Not things I can't change, like the high pollution levels in China, but more personal things which I could actually do something about. Here are two examples, and what I'm doing about them. First, for the last several months I've had this overwhelming sense of being left out, or not quite fitting in. No matter what I'd do, how much effort I put in, how many people I invited over, I'd still feel like I was out of the loop, a dollar short and a day late. I've been stood up on several occasions by people who invited me for coffee and then ended up finding something better to do, but forgot to mention it to me. I'm a big girl, this is not the type of thing that makes me cry into my pillow at night. But it does start to wear on me, especially when there was a two week period where I was stood up six times by four people (yes, two people actually stood me up twice)! Let's face it, there's only 24 hours in a day, and we all want to use our time in meaningful ways. And the experience of sitting in a coffee shop, waiting for someone who never shows up feels like a huge waste of my time! It was partly that experience which led me to come up with taking a rest from social media. How are they connected? Well, I don't know what your Facebook feed looks like, but mine was filled with photos of friends together with their other friends, doing fun things. It's fun when you're the person in the photo having a blast. It is markedly less fun when you've been left out, on purpose, accident, or because, you know, you live in China and they don't. It made me wonder if my own collection of photos might be making someone else feel as left out as I do. I thought it was time to give it rest, live a little less online and more in real life. But how has this solved my problem of feeling left out? It's only been twelve days of my social media break, but I've already found that when I'm not busy building an "audience" through clever sayings and cute photos, or spending my time looking at all the people doing something fun without me, then I actually have both the time and the focus to be able to interact with the person right in front of me. I'm not thinking of a funny status update I'll write later, I'm just actually living in the moment. There's also the unintentional side effect of people here in Shanghai claiming they desperately miss those witty posts of mine who have reached out to take me to lunch or do some some exploring. It's hard to feel left out when you wholly inhabit what you are doing in the here and now! I also realized that in trying hard to fit in, I'm giving up what makes me awesome and unique. After speaking with my husband, a new friend here, and my Mama (thanks Mom! ), I realized it's time to do a little trailblazing, to create something new, rather than trying to fit into something that already exists. So hooray for new ventures! The second thing I wrote during my retreat was how much my weight was bothering me. It's been almost a year since my hysterectomy. I was told most women gain an average of 20 pounds in the year after that surgery. I have very, very slowly been gaining weight. The tricky thing is that my clothes are snug but still fit. So unlike past years when I'd gain weight which immediately went to my waistline, I seem to be gaining in a whole new pattern, all over. It kinda snuck up on me. So what to do about it? Well, gym memberships are very pricey here. And I'm already doing almost all my own cooking, making healthy choices for myself and my family. I made that list of things bothering me the first afternoon of my retreat. And on the very first night I laced up my sneakers and went for a four mile walk at a quick pace. Not a jog, but not a leisurely stroll. And I've continued every day since then, walking for an hour at a quick pace. I skipped one Saturday which was so packed with other activities, and even though it was an "active" day, missing out on that walk meant I felt off all day. I know I could do more intense workouts and lose weight more quickly, but I need something I can stick with and enjoy for the long term. And taking a whole hour out of the same 24 we all get, using it to indulge myself with some solitude and a healthy activity does serious wonders in so many areas. There were many other things on my list, along with paragraphs of possible solutions for almost all of them. I'm not normally a list maker at all (I leave that to my husband), but this was an incredibly cathartic exercise! 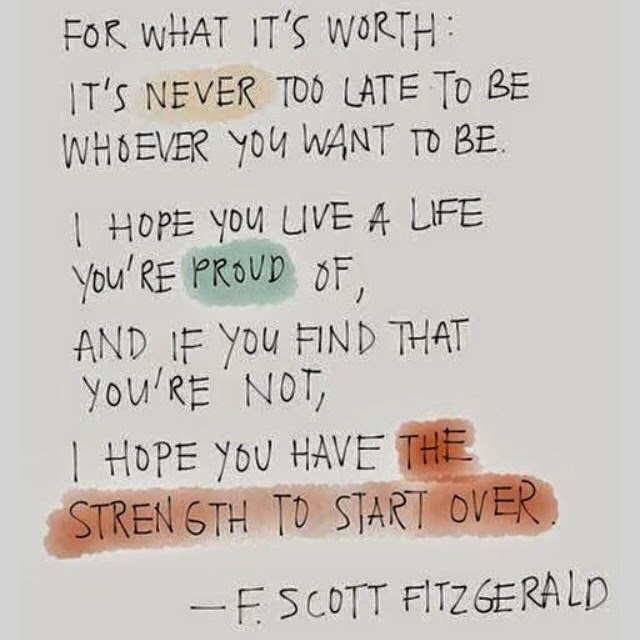 It was inspired partially by the quote above from F. Scott Fitzgerald. I'm not getting any younger. Every day I live is substracted from the total number I get. We move so often, change is thrust upon us so frequently, that we regularly get the chance to start over. But here we are, two years in the same place, with several more stacked up in front of us to go. So what happens when you realize you have to make a change yourself if you want to see one? I don't know yet, but I'm twelve days into the experiment and willing to find out! Oh, and P.S., I don't miss social media even one little bit so far. I thought I was going to have withdrawals! But instead I have so much peace in my head, I fear I may never want to go back! What a beautiful thing! First swim of the season!